LANSING — Gov. Gretchen Whitmer is overhauling the Michigan agency charged with environmental regulation, citing the need to more urgently protect the state’s water, bolster the response to climate change and direct more resources to communities disproportionately harmed by pollution and other environmental threats. The Department Environmental Quality (DEQ) will be reshaped and rebranded as the Department of Environment, Great Lakes, and Energy (EGLE), one in a series of executive actions the Democrat signed Monday. The orders drew applause from advocates for the environment and renewable energy such as wind and solar power, but concerns from the Michigan Chamber of Commerce. The orders may also draw pushback from a GOP-controlled Legislature, which last year made it tougher to craft state regulations stricter than those of the federal government and weakened standards for cleaning up toxic sites across Michigan. The Legislature could seek to overturn some of the Whitmer provisions. 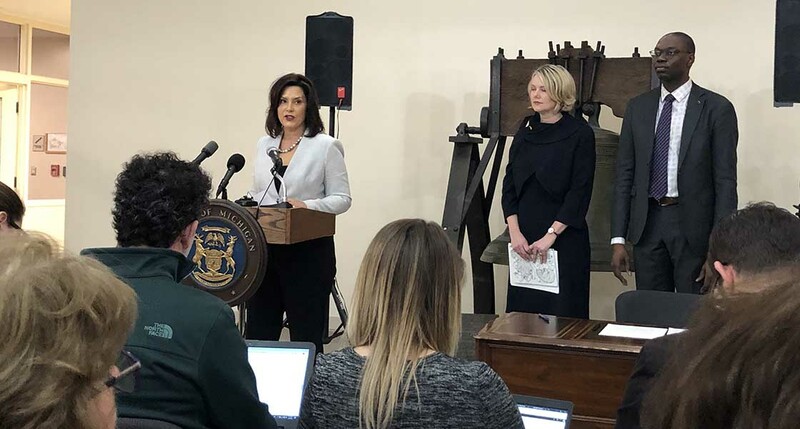 "The Michigan Chamber is disappointed that Governor Whitmer decided so early to reduce openness, accountability and transparency in the state government regulatory process,” Rich Studley, president and CEO of the powerful group said of the move. But Cyndi Roper, a Michigan policy advocate for the Natural Resources Defense Council, said shutting down the panel “put experts and scientists back into the driver’s seat” of environmental regulation. Republican legislative leaders said Monday afternoon they were still reviewing Whitmer’s announced overhaul, which takes effect April 7. “The Senate may hold hearings on the order so that the public and the legislature can better understand how this will impact state government,” Amber McCann, a spokeswoman for Senate Majority Leader Mike Shirkey, told Bridge Magazine. Whitmer’s move comes nearly five years after residents of Flint were exposed to high levels of toxic lead in their drinking water, a crisis largely attributed to failures in state government, including at DEQ, that battered the agency’s reputation and morale within its ranks. Under Gov. Rick Snyder, Whitmer’s Republican predecessor, DEQ listed its role as a partner in economic development as one of its “guiding principles.” Whitmer’s order appears to refocus the agency foremost as an environmental and public health watchdog. “We applaud Gov. Whitmer for showing true leadership on protecting our air and water by revamping the DEQ to return it to its true mission: protecting the health of Michiganders,” Mara Herman, health policy outreach coordinator for the Ecology Center, an Ann Arbor-based environmental and public health nonprofit, said in a statement. Whitmer’s orders do not add new funding for environmental regulation. The DEQ has faced consistent budget cuts over the years, and a state task force following the Flint crisis noted the agency’s drinking water office may have had the least funding in the region despite "having one of the largest, if not the largest, number of community water systems to regulate." Whitmer, who campaigned on a pledge to prioritize water, said Monday’s overhaul will help Michigan more efficiently address an onslaught of threats to its environment. That includes the harmful industrial contaminants called PFAS that communities are increasingly finding in their waters, and the wide ranging effects of climate change on the Great Lakes, which hold 21 percent of the world’s surface freshwater. The new environmental agency will include a “Clean Water Public Advocate,” “Environmental Justice Public Advocate” and an “Office of Climate and Energy,” Whitmer’s administration announced. Advocates will accept and investigate and analyze complaints related to drinking water and environmental justice problems, and work within state government to address them, under one executive order. The new agency will also house an interagency team — composed of agency directors across state government — to draw up a statewide environmental justice plan. The aim is to fix policies that disproportionately stick low-income and minority communities with pollution from power plants, factories and other sources. “This is better than a combined Christmas and birthday present,” said Dr. Lawrence Reynolds, retired president and CEO of Mott Children's Health Center in Flint, and former member of the Michigan Environmental Justice Work Group, which Snyder assembled following the Flint water crisis. “I think of my friends in Southwest Detroit who suffer cumulative insults to their environment and quality of life” as well as residents of still-recovering Flint. Whitmer’s executive order enacts some of the work group’s recommendations. Michigan has developed environmental justice plans in the past, only to see them scrapped, Reynolds noted. Meanwhile, an Office of Climate and Energy inside Whitmer’s new environmental agency will absorb the duties of the Michigan Agency for Energy, which will be abolished. The new office will “coordinate activities of state departments and agencies on climate response” and recommend ways to limit and adapt to climate change, which poses major threats to public health, agriculture and wildlife in Michigan. A separate Whitmer directive enrolls Michigan into the U.S. Climate Alliance, a group with 19 other states that have pledged to lower their greenhouse gas emissions. “It essentially says to the world that Michigan is going to live up to the promise that we as a country made at one point — that Michigan embraces science and recognizes the threat” of climate change, Whitmer said. Another executive order makes permanent the Michigan PFAS Action Response Team, which Snyder created on a temporary basis to flag pollution from PFAS, a group chemicals had been used to manufacture everything from Teflon and Scotchgard water repellent to firefighting foam. The group of so-called “forever chemicals” are linked to cancers, thyroid disease and other ailments. Michigan does not need MORE regulation, they need BETTER regulation and they need DEQ to follow the rules already established. I can cite situation upon situation where the Department is not following the rules already in place and imposing arbitrary standards to the people and businesses of Michigan. This needs to stop. Mike you are mistaking this to be about efficacy, it is just signaling to her left wing allies and imposing greater controls. Jobs and economics are irrelevant when it is only the power of the State that matters. Sounds like typical anti-environmental rhetoric to me, Mike. These are the same talking points that have been used for generations by people who oppose efforts to protect the health and habitat of citizens. Michigan has been suffering one of the most notorious environmental disasters in U.S. history, in Flint. It seems like nothing will convince people like you of the need for stricter regulation. And you forgot your citations. And Bones is just a bitter old Marxist with nothing better to do than wait for his government check! And your supporting examples please? You know what's a real job killer? Being dead from cancer or some other pollution-caused ailment! Seems like the collapse of the global economy due to climate change would also kill some jobs. Grandpa why do I have cancer? Because of exposure to toxic chemicals in our environment. But Grandpa, why was I exposed? Because I am a Republican and we can't have regulations get in the way of Profit. Oh, am I a Republican Grandpa? No, you are just a hapless victim. I’m still waiting to learn if products made with Teflon and Scotchguard are safe, or is Pfas only harmful when it’s in water? Barry, with the right people everything will be found to be harmful! Every eight years this agency and or its sister MIOSHA/DLEG/LARA gets a name change and new marching orders.They then spend eight years figuring out what it is that they are supposed to do under this new management and when they finally figure it out, we change governors (term limits) and we begin all over. The State is doing the regulated community no favors and are costing companies and taxpayers significant amounts of money with no real gain in environmental or health and safety performance. We barely have time to get all the stationery changed. Changes in regulatory agencies should only be made when necessary and then very - very slowly. If the DEQ becomes Department of Environment, Great Lakes, and Energy (EGLE), will there be the same focus on Asbestos Emissions , and other programs that protect human life and health? What about other toxic emissions? Will the state be depleting the ranks of currently high profile offices in order to staff these new functions and how will that impact the health of Michigan Residents? This is on of the good arguments against term limits. For those in the comment thread who believe, or at least pretend to believe, that we have to choose between a healthier environment and healthy employment, here are some actual facts. Quote: "Despite the rhetoric, economists have not found clear evidence of the net effect of environmental regulations on employment. The impact often depends on the type of industry and the health of the economy. But there is little indication that environmental regulations substantially impact overall employment figures." The propagandist that wrote this article carefully selected his comparisons to prove his point. Why this would be called a journalist resource is beyond me. Fact: Every EPA (or other) regulation costs real money to implement and maintain. Fact: If American manufacturers are required to comply with regulations, and Mexican, Indonesian or Chinese manufacturers are not, there is a cost of production difference that gives real advantage to foreign companies using foreign workers to sell products in our marketplace. We have seen the effect on American manufacturing workers of jobs going overseas. Despite all of the debate about economic development and job creation, there are certain facts that should guide our environmental protection policies. Unless or until we figure out how to repair the damage we do to our air and water and soil and to detox or reverse the poisons we introduce, we need to do everything we can to protect the environment we occupy and to refrain from practices that damage it. We need air and water to live. We need it to be clean and free of poison to be healthy. Our progeny will also require clean air and water to live healthy lives. Unless we value wealth and prosperity above health for ourselves and our children, regulations to protect our environment are essential and should be non negotiable.